Home Local News Senator Trillanes Gumastos ng Mahigit sa P245 million DAP sa Loob ng isang Taon? MUST READ! 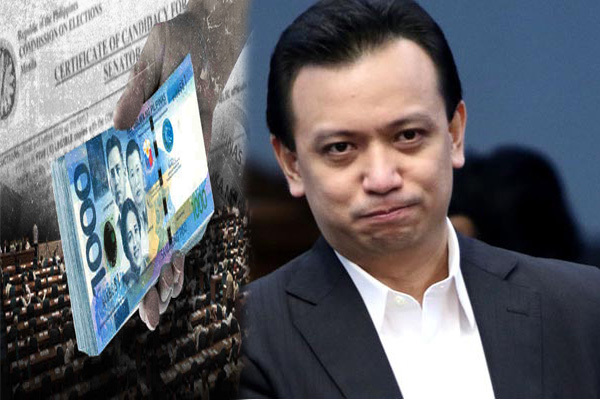 Senator Trillanes Gumastos ng Mahigit sa P245 million DAP sa Loob ng isang Taon? MUST READ! Sen. Nancy Binay dared yesterday Sen. Antonio Trillanes IV to explain the P245 million in Disbursement Acceleration Program (DAP) funds allocated to him from 2011 to 2012, higher than those of other senators. “Maybe it’s better that he does the explaining and show where the P245-million DAP went in a span of just one year,” she said in Filipino. Sought for comment, Trillanes said he is ready to defend the DAP as well as Priority Development Assistance Fund (PDAF) or pork barrel allocations under his name. “All my projects related to DAP/PDAF are posted in my website,” he said. In an interview yesterday ahead of the resumption of the Senate inquiry into the alleged overpriced projects in Makati, Binay said Budget Secretary Florencio Abad seemed to favor Trillanes with millions in funds from DAP, which the Supreme Court (SC) has declared unconstitutional. “I am wondering if Trillanes is a favorite of Abad of the DBM,” she said in Filipino, referring to the Department of Budget and Management chief. “Because when I computed the allocation for Trillanes, it came out as P245 million. “There’s Oplan Stop Nognog for 2016… Now I found out that Sen. Trillanes got P245 million DAP from Sec. Abad,” she said in Filipino. DBM documents on DAP showed releases of funds for various local projects under Trillanes’ name totaling P245 million. Binay said the P245 million given to Trillanes came in three tranches – the allocations were different from the P200-million annual PDAF for each senator. Binay said she is wondering whether DAP funds are bankrolling the attack against the Binay family. “Is it because of the millions in funds that they are insisting on wrecking the reputation of our family?” she asked. Trillanes said he got the DAP and PDAF allocations when these were not yet declared unconstitutional. “All of these were audited by COA and they did not see any negative findings,” he said. At the height of the DAP controversy, former Senate president Juan Ponce Enrile, Sens. Franklin Drilon, and Francis Escudero received P100 million in the form of projects under the DAP. The rest of the senators except for Joker Arroyo, Miriam Defensor-Santiago and Ferdinand Marcos Jr., supposedly got P50 million each, but they claim that they weren’t informed that the funds came from DAP, which were savings that the DBM had lumped into one fund. In a privilege speech, Sen. Jinggoy Estrada revealed that senators got P50 million in DAP funds in mid-2011 to vote in favor of convicting then chief justice Renato Corona during his impeachment trial.